In honor of George Harrison's 75th birthday (February 25), the Grammy-winning, 8-times platinum release Concert For George, will be available for the first time on vinyl, released as a 4-LP Box Set, as well as a Limited Edition Deluxe 10-disc Box Set via Concord Music. Says Olivia Harrison, "We will always celebrate George's birthday and this year we are releasing Concert for George in a very special package in memory of a special man." The Deluxe Box Set (limited to 1,000 pieces worldwide) features the complete sound and film recordings from the concert (on 4 180-gram audiophile LPs, 2 CDs, 2 DVDs and 2 Blu-rays), a 12"x12" hard-bound 60-page book, plus an opportunity to own a piece of the historic event, by way of a cutting from the original hand-painted on-stage tapestry used as the backdrop at the Royal Albert Hall on November 29, 2002. The package is housed in a gold-colored, fabric-wrapped box with a die-cut mandala window to display the unique stage fabric (which is mounted on an individually numbered card, suitable for framing). Includes a note from Olivia Harrison, explaining the story behind the tapestry. 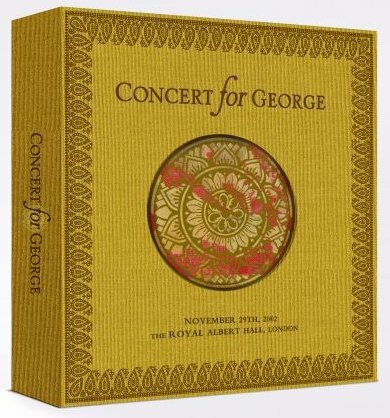 The 1,000 Limited Edition Deluxe Box Sets are only available on ConcertForGeorge.com. The 4-LP Box Set includes the complete sound recordings from Concert For George, on 180-gram audiophile vinyl, featuring a special, mandala-design etched on side-8. This is the first time that all songs from the performance have been available on an audio configuration. The album will also be made newly available via streaming platforms, track listing mirroring that of the vinyl. In addition to the vinyl formats, the release will also be presented as a 2-CD set, as well as newly issued 2-CD + 2-DVD, and 2-CD + 2-Blu-ray combo packages. The 2-CD set features sound recordings from the concert. The 2-disc DVD and Blu-ray sets also include the complete filmed concert on the first disc, with a second disc containing the original theatrical version featuring concert highlights, interviews with the performers, rehearsals and behind-the-scenes footage. Exclusive to the Blu-ray format, the second disc includes an interview segment featuring Ringo Starr, Jim Keltner and Ray Cooper, entitled "Drummers." Directed by David Leland (whose credits include the feature Wish You Were Here,HBO's Band Of Brothers and the Traveling Wilburys video "Handle With Care"), Concert For George captures stunning renditions of some of the most significant music of the 20th century, including "While My Guitar Gently Weeps" (featuring Clapton on guitar, McCartney on piano and Starr on drums), "Taxman" (performed by Tom Petty and the Heartbreakers) and "The Inner Light" (covered by Jeff Lynne and Anoushka Shankar). Lynne, Harrison's longtime friend and collaborator, produced the audio elements of the concert, while Clapton oversaw the entire proceedings as Musical Director. 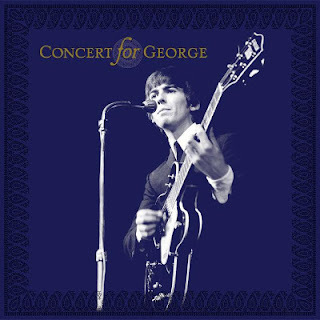 Concert For George has been certified 8-times platinum by the RIAA since its initial release as a 2-DVD set in November 2003 and earned a 2004 Grammy Award for Best Long Form Music Video.